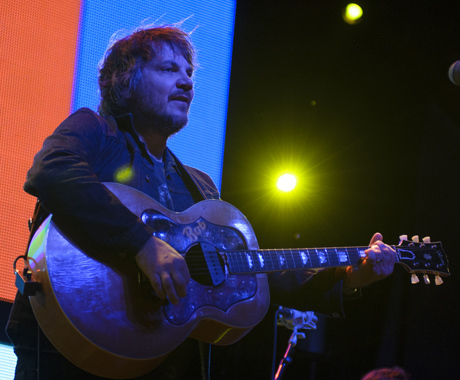 Earlier this year, Jeff Tweedy recorded an album with his 18-year old son Spencer under the fitting moniker Tweedy. Assembling a small band including Eleventh Dream Day guitarist Jim Elkington, bassist Darin Gray and keyboardist Liam Cunningham of Marrow, the two Tweedys used night two of the 11-day festival as an opportunity to try out new songs from their upcoming LP, Sukierae. Pulling a massive crowd to the festival's smallest of its four outdoor stages, Jeff looked confident and loose playing with his stage mates, cycling through 40 minutes of new material that found the crowd genially bobbing and clapping along. But it was the back end of the set that ignited the Friday night crowd as the band left Jeff alone to perform 35 minutes of Wilco and Uncle Tupelo material. It came as no surprise that the crowd responded best to the trio of tracks from Yankee Hotel Foxtrot, as a chorus of voices could be heard singing along to "I Am Trying to Beak Your Heart," "Jesus, Etc.," and "I'm the Man Who Loves You." But it was the stark versions of album cuts like "Passenger Side," "Hummingbird" and "Spiders (Kidsmoke)" that made Tweedy's solo outing the highlight of the evening. Returning to the stage for a three-song encore that included a rendition of "California Stars" that saw Jeff trying to change the words to "Can-a-dee-an Stars" Tweedy's band gelled together flawlessly, giving the crowd a multi-dimensional performance from this multifaceted musician.